Kangaroo care seem so simple, the art of putting a baby skin to skin with the mother or other primary caregiver. It makes such sense, that the natural body warmth of the mother will keep the infant warm, that this intense contact will help milk supply. Especially in the developing world, this is so vital. Formula is expensive and hard to get, and can be contaminated easily. Exclusive breastfeeding is so important. Why do we need an awareness day for something so simple? The fact is that the benefits of kangaroo mother care are not known throughout the world. Unbelievably, in some developing countries, and even in the UK at times, kangaroo care is seen as primitive, and that incubators and artificial forms of care are somehow superior to a mother or father's love and care. I'm not saying incubators aren't important, they are of course, and having the latest equipment is essential too, but particularly in developing countries, implementing simple measures can and will save lives. It is estimated 444 000 babies could be saved by a programme of kangaroo care in developing countries. I wasn't given access to Joseph for kangaroo care until he was a month old, and he wasn't a particularly needy neonate, the hospital just hadn't come across a mother wanting to do it before, with such a young baby. In some hospitals babies are offered kangaroo care whilst still ventilated. I also felt passionately that my husband needed to kangaroo too, and this wasn't encouraged either. So we just did it! In the UK this is changing. Hospitals are implementing more and more family centred care initiatives, and the benefits of kangaroo care in the UK are largely accepted, so if you do need to challenge there are some clear resources you can use. Where the real issue is, is in the developing world, which I outlined in this post during the release of the Born Too Soon report. If you are passionate about this, join in today, tweet, share and spread the word. If you work within hospitals, raise awareness about kangaroo care. It's up to us, as mothers, to help those mothers without resources, without a voice. I remind you again that Save the Children are working hard on this issue internationally. When I first had kangaroo care with Joseph, it healed my heart. I felt bonded with him, I felt like his mother, that he was mine for the first time since birth. It's just so important. Here are what some fellow mothers had to say. Please do what you can to help more mothers bond and care for their babies the way nature intended, and for doctors and nurses to understand the power of kangaroo care. Hopefully hospitals are becoming more aware. It's sad though that you had to wait a month! I read a story about a baby who was believed to have died in birth being given kangaroo care by his mother and that actually stimulated his organs to get going again! I had to be transferred to a hospital out of my region due to the lack of cots available in the West Midlands and stayed there for nine weeks before being transferred closer to home. Fortunately the nurses encouraged parents to give kangaroo care. I gave kangaroo care at every opportunity but the evenings were even more special once visitors/parents had gone home and I would sit for hours with my baby as I was able to sleep on the unit for the whole nine weeks. I learnt over time that not only was kangaroo care great for the bonding process and the production of breast milk it also helped my son's brain develop. Kangaroo care creates more neurological pathways in the brain and my son, now 5, is very loving and we are very close. I am surprised to learn this isn't encouraged at some hospitals and raising awareness will hopefully teach other hospitals to consider implementing and encouraging such a natural thing. We had twins at 29 weeks and it seemed to be forever before I could hold either of them adding to a very surreal entrance to parenthood. We kangaroo cared for A after a week and E after 9 days and it was 6 weeks before we had a family cuddle. The contact was dictated by the confidence/availability/amenability of the nurses as well of course as the babies condition. If I were to go through it again, I would be more assertive about kangaroo care early on and request it more consistently. We were really lucky in that our ward was passionate about Kangaroo care led by a dedicated sister. As soon as were were able to hold him at a week old they were stripping us off and tying us the baby with sheets and blankets. They even gave us a hand mirror so we could watch the baby's face when he was at an awkward angle. Unfortunately there wasn't always enough staff on hand to enable it but when there was they took every opportunity to help us. My husband was likewise encouraged. Like the other mums these were the moments when I felt like a mummy at last and sure this helped the process when expressing/breastfeeding. Kangaroo care gave us our most precious memories of those early months. Very disappointing, both in Africa but especially here, as it should be being routinely offered. It's in the UN baby friendly initiative that hospitals are ascribing too. Makes me very cross. 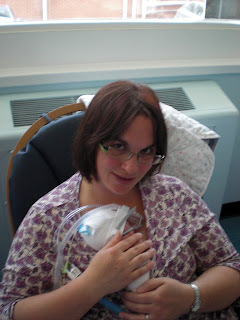 We still do kangaroo care now when Joseph is fractious or poorly. That is really sweet, that he was offered it, and that he declined it. My in laws came to see me in hospital, but refused to see Joseph as I hadn't met him. I thought that was very lovely of them. It does seem unbelievable its not on offer at all hospitals, and I am blogging about this to make parents more aware and to ask, and to use the resources and research too. I just took kangaroo for granted and was surprised when I looked through my archives I'd never blogged about it before, so I'm just as bad!